We are proud to announce our new update comes with a new Tag accounts feature for the timeline posts where you can tag any Instagram account to your posts. To be able to tag accounts just add an image to the post and click to the preview of the image on the right panel. A popup will open up, then click where you want to tag the account on the image and select that account you are looking for. If you can't find it on the suggestions then keep typing the handle name and will search it for you. Yes, that easy! Good news is that we didn't end up there. We also have added some more improvements on the Auto Like addon. Now the error that couldn't find more posts to like should get reduced since the new Algorithm will be looking on older posts, not only the first to appear on the different pages. 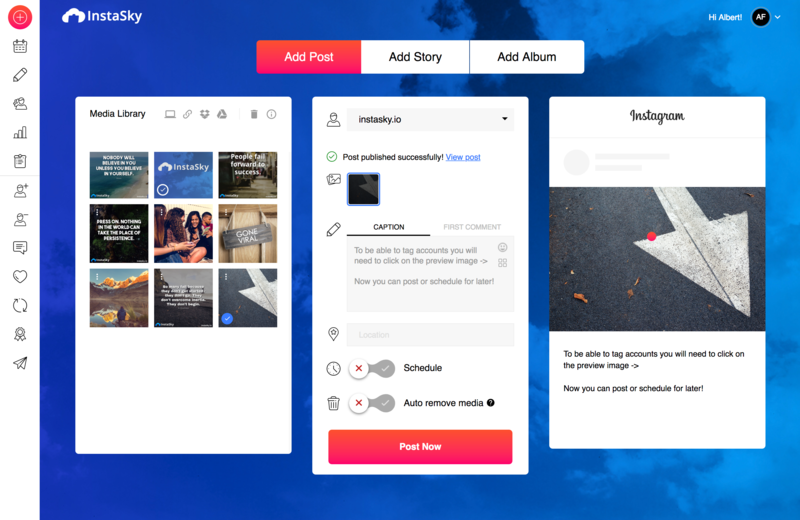 I hope you all like this new feature and I am super excited of the new stuff we are working on like the story builder where you will be able to add stickers and text to your image stories or the product tag for those ecommerce accounts. If you want to see the new tag feature in action check the video below! Thanks to all of you! All the support and your fantastic ideas are the ones that drives us to deliver!